Have you ever wondered which NFL games will be televised in your area this week on CBS and Fox? Here’s how to find out ahead of time. 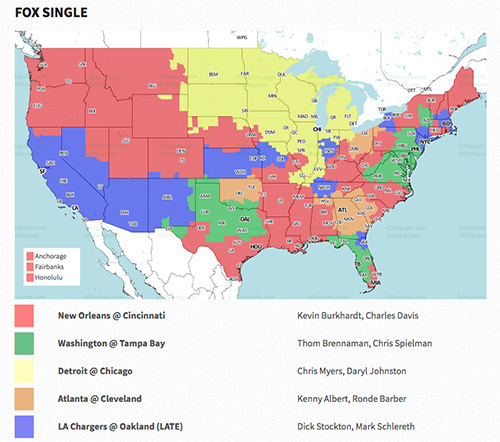 The website the506.com publishes updated NFL regional telecast information each week. The site gives you not only which game will be telecast in your area, but it gives you the broadcasters who will be calling the game. Each week you’ll typically see three maps. One for the Early CBS Game, one for the early Fox game, and a third for the late doubleheader game. The late game will be either Fox or CBS depending on who owns the doubleheader rights for that week. Game information is updated on the site typically during the middle of the week. So, if you check earlier in the week you might still see last week’s information. The site has a disclaimer that the information is unofficial and subject to change. Whether just for your own curiosity, or to avoid scrambling to find a sports bar at the last minute, check out the506.com each week before game time.